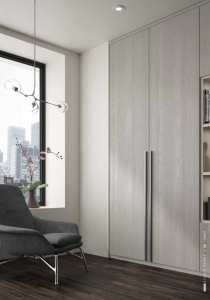 Many of you have asked me about the “closet without verticals” or the “European Closet System.” It’s in stock just in time for you to freshen up your showroom for the new year. It’s something that you should definitely be showing because if you haven’t been asked for a system like this yet – you will be soon. 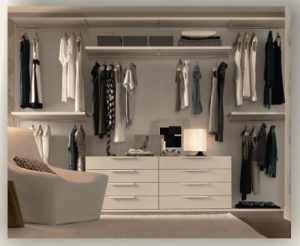 The Vertiko Closet System has a short learning curve and is pretty easy to install. There’s plenty of adjustment built into the stanchions to follow the bows in the wall and the slope of the floor. We have brackets for cabinets, shelves, closet rods and every combination. This is also a great system for entertainment centers because you can easily hide the wires behind the back panels. If you have questions or need more technical info please email me at RDeMarco@richelieu.com. 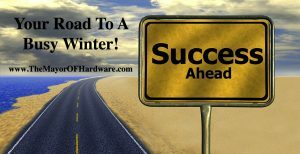 Part II – Successful Closet Companies Are Doing This… Are You?? Now is the time to start thinking about those slow winter months. Waiting until Christmas to deal with a soft January is too late. Hopefully by incorporating some of the following strategies you can start the year on a high note. If you missed Part I – click here. I want to start with discussing the importance of keeping your installation schedule. Getting your jobs done and sticking to the calendar improves your cash flow and increases profits. Especially if you don’t supply them with the proper tools to prevent a service call. Here is a list of tools and jigs that most of my closet customers have on their trucks. Festool Track Saw – this is a must and I bet it pays for itself the first month. I was at a trade show 3 years ago, we were setting up our sliding door display and the doors were too big. I used my track saw – cut thru the 2” aluminum frame and a ¾” melamine insert – I was blown away when I saw that it was a clean cut on both sides. Imagine how easy cutting down a few shelves would be. If you do have to cut down shelves, chances are you will need to re-drill them for cams. Here is a great solution for drilling cams on-site. Do you ever scribe a counter tops, toe kicks or verticals? The ThingAMeJig Scribing Tool makes it quick and easy. Not only will your installer thank you, your finished product will look much better – leading to more referrals. How much time do you spend installing handles? Do you have a jig you made out of melamine? The Precision Handle Jig will ensure every handle is centered and straight. 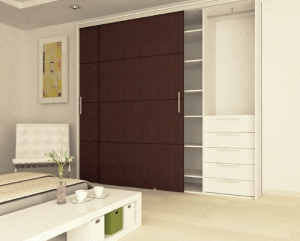 Are you still installing an old clunky Murphy Bed? If your client prefers a bed that deters overnight guests – your spring system is the way to go. If they are looking to give their mother in law a nice place to sleep or hoping that their grandchildren visit more often than you should be offering your client a piston bed with a built in box spring. Selling a higher end product will increase your profit. If you’re not selling beds at all you are missing out on revenue stream that every major closet company offers. Many of you have asked me about the “closet without verticals” or the “European Closet System.” I finally have it in stock. If you have a showroom, it’s something that you should definitely be showing. This system is great for entertainment centers because you can easily hide the wires behind the back panels. During the recession my sliding door hardware sales spiked. Replacing builder grade by-passing doors was an easy way for you to add an extra $500 to $1,000 to your job. Now that you are busy and the economy is good you have gone back to telling your customers you don’t install doors. Even if you installed one set of doors per month you could add an extra $12,000 per year. I sell a surface mounted ball bearing system that takes minutes to install, hangs from the header and works with ¾” melamine. There is no reason to pass on this business, all you need to do is create a system. I gave you 8 different strategies that you can use to put a little extra money in your pocket next year. I’m not telling to do them all at once. Start slowly, train your designers and installers on one new program per month. Watch how quickly your average sale increases! 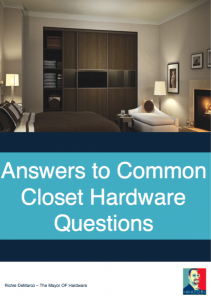 In the following E-Book you will find answers to questions that I am constantly being asked. Included are links to installation videos, pics and best practices that I have picked up along the way. If you find value in these tips please forward them to a friend, if not deposit in your circular file. Are You Planning to Enter the Top Shelf Design Contest? Well you should be and here’s why. You have the chance to become an “Award Winning Designer” – Talk about differentiating yourself from the competition. It’s something that you can add to your business card, promote on your website and include in your advertising. Business owners with design teams you should encourage all your designers to take the time and enter… How great would it be if a couple of them won? You could repurpose each entry as a “project” on your Houzz profile… Still don’t have one?? Click here to receive quick tips that will help you get started. You will be recognized by your industry and you can leverage that with your potential clients too! Check out some of the interviews from last year’s winners. The cocktail party at the expo is always a lot of fun – it’s great catching up with friends and making new ones. Start planning your entry now – The deadline is March 13th. Need some inspiration? Here are a few of last year’s winners.